Pat (Group1) sent me a lovely spring coloured appliquéd fabrics base, I forgot to take my before pictures for both flags I'm working on, when I get them I'll add them to this post. 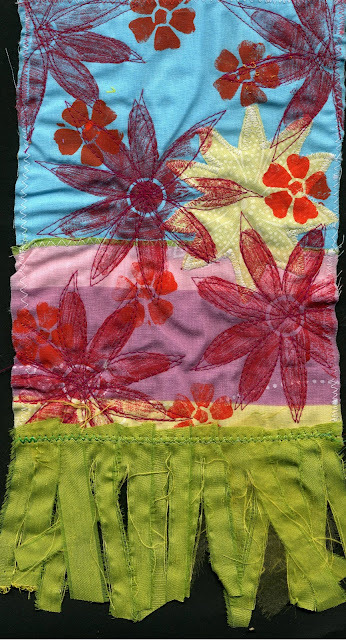 I stamped bright red and orange flowers over the base and then machine stitched lots of petals around the bigger red flower. I also added a lime green fringe. Its always difficult to know when to stop but I think there is still plenty that can be done here. Flo (Group2) sent me an earthy abstract base. I stamped swirls all over it, machine stitched them and then stencilled my all time favourite image of a goddess over this, I then added an earthy coloured ribbon as a fringe. I look forward to seeing how both these are finished off in the final round. These are both lovely. I'm now wishing I joined this group!